'Police Integrity Commission' Why do you lie like that? A Police Integrity Commission inquiry which took more than a year, heard more than 50 witnesses - many of them senior police - and cost millions of dollars, has recommended that no action be taken against anyone. MAXINE McKEW: The Wood Royal Commission exposed entrenched and systemic corruption in the NSW Police Service. Commissioner Peter Ryan was recruited from the United Kingdom to clean up the force once and for all. A crack emerged in the "new look". A consultant to the service's reform unit has gone public with extraordinary allegations that senior police are trying to white-ant the reform process by smearing members of his team. But yesterday's PIC,166-page report was released and, says there is no evidence to support allegations made in October 2000 by members of the Crime Management Support Unit that their work was being undermined by senior police who were deliberately obstructing reforms. But it is strongly critical of the former head of Internal Affairs, Mal Brammer, who conducted a covert inquiry into alleged travel rorts by some members of the unit earlier that year. "There was evidence to support the allegation ... that Brammer was affected by bias in his investigation." There was also a "lack of fairness" in his inquiry "in that none of the individuals concerned were spoken to about the allegations against them." QUENTIN DEMPSTER: Three years after the Wood royal commission found entrenched and systemic corruption in the NSW Police Service, public confidence has been returning.[?] Hundreds of suspect officers have resigned, retired or been sacked [but none sent to prison?] under Commissioner Peter Ryan's dismissal powers. The entire service has been reorganised. It's no longer a hot political issue. But there was a disturbing sign -- the Police Integrity Commission damned the service's Internal Affairs Unit's competence in what was known as the 'Dresden Report'. But yesterday's report was attacked by the NSW Opposition, which said it had not even been written by the person who had heard all the evidence and seen the demeanour of the witnesses, Judge Paul Urquhart. "I don't know what to make of this report, we don't know who wrote it," said Andrew Tink, the spokesman on police. "The guy who heard the evidence didn't write it. I think the PIC or the Minister for Police has an immediate obligation to explain why." The PIC has previously said Judge Urquhart would have "input" into the final document. 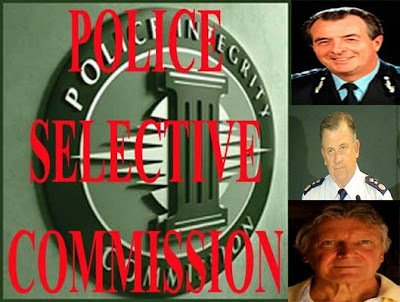 The report is also mildly critical of the former commissioner, Peter Ryan, saying he made errors in the way he went about establishing the unit in June 2000 under the command of a seconded British policeman, Ken Seddon. The aim of the unit was to help local crime managers target crime better, but it was also supposed to help cultural change by, among other things, improving the interaction between senior and junior staff. The PIC also criticised a key member of the unit, Jim Ritchie, who helped trigger the whole saga by holding a press conference in October 2000, accusing senior police of blocking reform and being incompetent, drunken and bullying. While he could be "charismatic", he also appeared intolerant and some of his allegations were "exaggerated and unwarranted", the report said. The PIC found that while some senior police did not always support the work of the unit, "there is no evidence to support the sweeping allegation ... that senior members of the service were deliberately obstructing the reform process". But back then Deputy Commissioner Ken Moroney, heading internal affairs, defended its integrity. Are you asking the public to accept this isn't part of a deliberate process of whitewashing by the Police Service? DEPUTY COMMISSIONER KEN MORONEY, NSW POLICE INTERNAL AFFAIRS: No, I don't believe it is part of a pattern, particularly in the Police Service of the year 2000. JAMES RITCHIE: It reveals a world of total incompetence, of drunken, threatening, bullying, hand-picked members of the commissioner's executive team. Of deputy commissioners meeting senior constables secretly in pubs to correct their own superintendent-level posting errors. Of constant last-minute scrambling to make the commissioner look good. The senior executives of the Police Service are simply not committed to deep and abiding reform. THE VOTERS: Bob Carr's head must roll. WHY DO YOU LIE LIKE THAT? BECAUSE THE GOVERNMENT TOLD THEM SO! The New South Wales Opposition wants the victims of crime to benefit from the confiscation of criminal assets, rather than the state's police service. A spokesperson from Justice Action Mr Brett Collins said, "Victims should be properly compensated regardless of the source and that is currently the law. The law says you don't need to find even the offender to get compensation. This is an attempt by the opposition to create a law and order issue-involving victims when there is in fact no issue! The 800-year-old rule prevents a person who's acquitted of a criminal charge from ever being re-tried for that offense. Perception of crime is still a problem in NSW, with a new Productivity Commission report showing the state's citizens feel less safe than most of their counterparts. The state's newest Supreme Court judge, and former Labor attorney-general, Jeff Shaw, has issued a warning to his former political colleagues: do not allow the vagaries of politics to undermine the independence of the judiciary? In Sydney yesterday the Opposition police spokesman, Andrew Tink, urged Federal Labor MPs to allow the public hearing of the claims, which include that senior police, the PIC and the Ombudsman's office were failing to investigate legitimate complaints of misconduct, including corruption in the police promotion system. The promotion of law and order means money to big business. Profits from insurance, security fixtures, patrol services and the like can only continue to grow if the perceived threat of uncontrollable crime wave escalates. In the past few months there have been many examples of the true nature of our blood thirsty politicians and their sinister attempts to spoon-feed a not so gullible public with their repetitious rhetoric.